That was the question asked to Drexel University Professor Ramesh Raghupathi. Professor Raghupathi is a part of the Department of Neurobiology and Anatomy at the College of Medicine. His expertise is the spinal cord and concussions! Brill’s 4th grade Advance Math class received the opportunity to Skype with this scientist. He greeted the students and told them to wait a minute as he had a surprise. What could surprise 4th graders? On went the purple latex gloves and he reached down into a container pulling a real HUMAN BRAIN! The room was filled with oh no’s and wows! Does the brain have something to with dreaming and why? When you have a concussion do you lose memories? What does your brain do when you have a concussion or how your spinal cord responds? When you get a concussion you see stars but why do you see stars? What is the average size brain? A student’s reflection talked about the size of the brain and one might have one side bigger. He noted my brain is bigger on one side because of my math and science knowledge! I only wished! Another reflection from Hamna: “Hoping to meet Mr. Raghupathi in person because he is brilliant!” She continued wanting to share this experience with her parents as not every day you get to learn these extraordinary facts. My reflection was back to me as a ten year old and never imagining, seeing, and communicating with a professor holding a human brain! Klein ISD through the availability of technology has provided a promise for a purposeful learning experience. Yes, that is a human brain and I hope to fill yours with a purpose! 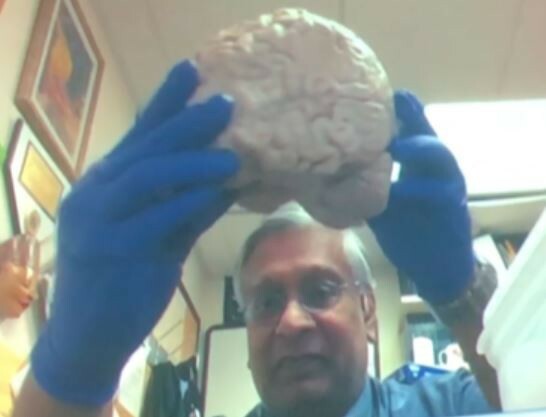 Is That A Human Brain You're Holding?